Amazed with the futuristic vehicles Star Wars and the Marvels had? The flying cars, space-bound rockets, and other fantasies that were just a part of the childhood once, are the emerging future now. The engineers around the world strive to bring the reel life to real life. And who knows they may have almost done that. Ever had a thought, “I would build one of these vehicles once I grow up?” Then, while pursuing aerospace engineering course you are moving towards your dreams at a good pace. To reach your destination all you need to do is finish the course with flying colors and prove your worth. You would be assigned with plenty of academic tasks for evaluation purpose. All you need to do is carry them through like a pro. We understand when you are dreaming of future technology, the toughest part is to be patient enough to reach the goal. Same patience (Okay, a little less) is required when you work on your writing tasks. We know it is difficult for you to work on your writing tasks, but no worries. These minor obstacles in the direction of your dreams’ flight can be overcome with our aerospace engineering assignment help. To make the task interesting for you we have listed here a few trends that are taking aerospace technology to the future level. Talk about these in your college assignment and prove your passion for the subject easily. The idea has turned heads not only in the commercial sector but in civil sector too. For now existing in parts as aerial photography, 3D mapping, agriculture, wildlife protection, etc. at a mediocre level, the technology is paving its way to the wider levels. The researchers of the subject aim at building it as the future of the aerospace industry. Include this as a topic for your assignment stating its significance, alternatives and the history. Also, discuss how evolution in the industry is making things easier. When it comes to general data handling in commercial aircraft the challenges seem really small. The bigger challenge is to collect and store data that these aerospace vehicles gather. It is not just collecting and storing the data but also streamlining it in a proper manner that matters. Once the experts come up with advanced technology, exploring the outer world would become much easier. Another interesting topic that can be explored for your assignment writing task. Just a little research and you are up with a plethora of ideas that can help you impress your professors. It is not just how the aircraft runs matter, but also how it is manufactured that matters. The process was quite complicated when Wright Brothers tried building their airplane, but not with the latest technologies the process has simplified. From the body of the craft to just small bolts the sizes can easily be calculated to get nothing less than perfection. It is not just about making the task easier, but more efficient and less chaotic. Exploring the topic could not only add to your grades for the innovative area of research but also help you understand the evolution in the industry easily. The plasma-based rocket propulsion technology that has gained attention from the researcher’s around the world. The VASIMR (Variable Specific Impulse Magnetoplasma Rocket) that was developed a few years back by the NASA with Department of Energy and the Oak Ridge National Laboratory aims at reducing fuel consumption. With the technical experts extending their arms for further research, the technology is being talked about a lot. Evaluating the criticism that is often made along with the ups and the downs during the advancement can prove to be an interesting topic for your aerospace assignment writing task. Alexa and Siri have made things so easy for us. Just a query or command and there you are served with the best results. The floating AI astronaut assistant is quite similar in functionality but the users are quite different. It is meant for the astronauts and is equipped with the information that could help astronauts with repairs. It would also help them experiment in outer space and talk basic medications too. Taking this as a topic for your aerospace assignment writing work would not only keep you engaged but also help you explore the roots of artificial intelligence lies in the field. Thanks to technology, nothing seems very far. Already feeling like Mark Watney from the Martian??? Well, who knows with the sci-fi turning to reality at such pace one could be. These advancements are just the things that happen on stage. There is a lot that goes behind the curtain and to be a part of it all you need to do is work well in your course. 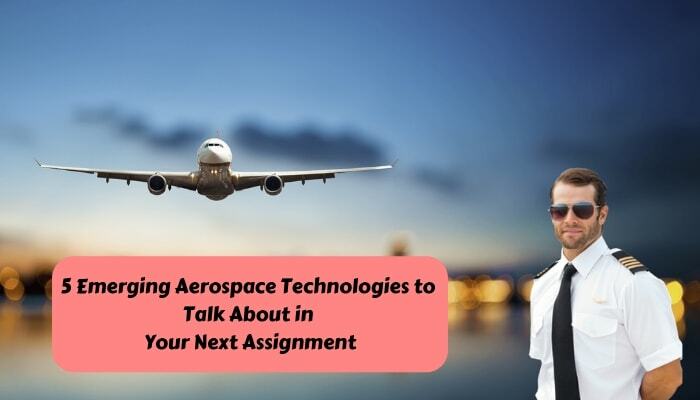 Taking up the topics from the silent face of the aerospace engineering curriculum would not only help you draft adept documents but also reflect your childhood passion in your work.